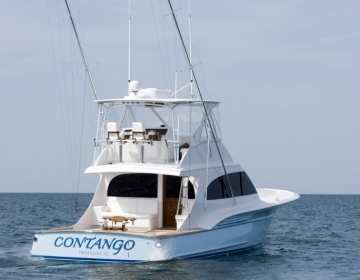 Proven fish raiser & tournament winner along the East Coast and Caribbean, the Contango is proof positive that Jarrett Bay is the choice for those who demand the best. Entering the salon, there is a large L-shaped sofa to port. Forward of the sofa, there is a large granite counter, and built-in to the cabinet beneath you will find roll-out freezer and refrigerator drawers. There is granite counter top in the front of the galley with three large roll-out storage drawers. Above the rollout-drawers are three cabinets and a built-in convection microwave. The galley has a cherry and holly sole. 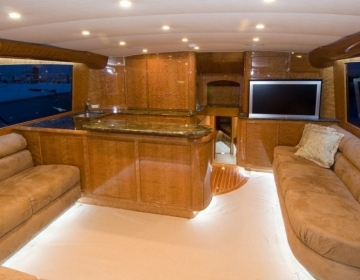 The galley and salon have a high gloss cherry finish, showing the finest workmanship possible. There are cherry steps with inlaid teak to lower cabin area. To port you will find the master stateroom with an island queen bed, a closet and a lustrous high gloss cherry finish. The master also has a spacious full head. The guest stateroom is forward with three bunks. There are two bunks in the companionway on the starboard side along with a second bathroom with a full head and shower. Great boat!! Is it for sale? Above it’s listed as available. Please let me know. Sorry Jens, this vessel is no longer on the market currently. 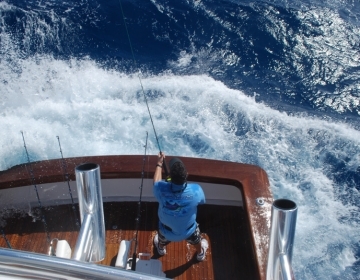 The Browse Inventory link is the best way to keep up with Jarrett Bay boats currently for sale. Thanks for your interest and let us know if we can answer any questions?